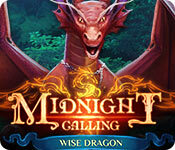 Elephant Games brings you a thrilling new adventure in Midnight Calling: Wise Dragon! Midnight Calling: Wise Dragon is rated 4.4 out of 5 by 11. Rated 5 out of 5 by Lemonade8590 from My Kind of Adventure I found this game both fun and challenging. The storyline is good, the graphics are excellent and I was pleasantly surprised that the games had a few new flavors, giving a bit of a challenge without being too difficult. While I did notice it having to load once or twice, it took a mere split second. I thoroughly enjoyed myself and felt it was well worth the money. Rated 5 out of 5 by firewitch13 from Lovely fantasy I just finished playing the demo version and thoroughly enjoyed it. Fantastic graphics they're clean and crisp and a total joy to look at. The story is a lot of fun. I agree with some of the other reviews that the instructions are simple and easy to follow, which makes for much more enjoyable adventure cant wait to purchase the full version and finish the story. My only minus on this game was that I found the music somewhat monotonous. 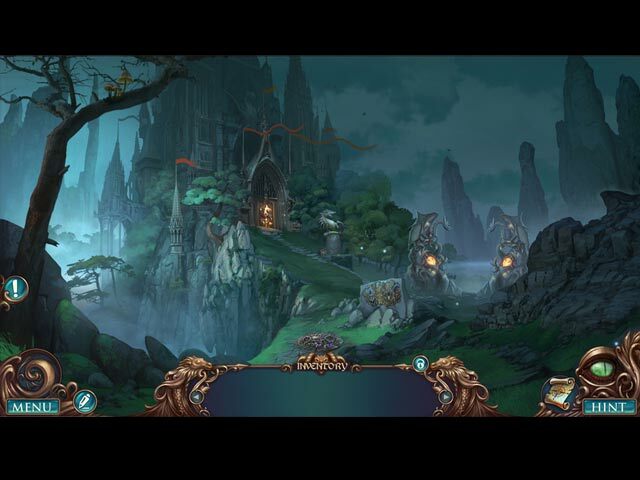 Apart from that so far its a great game and I would definitely recommend it if you like fantasy adventure. Rated 5 out of 5 by CornishPyrate from A great game I usually choose Elephant games because I know I won't be disappointed. They always produce an enjoyable experience but, this one is my favorite so far. They have shown they have amazing imagination. The game is challenging but not frustrating. I've played it once, including the bonus content but I didn't do as well as I would have liked so I'm definitely going back again to try getting what I missed the first time. Buy this game, you will love it on any level. I played it on custom setting as I like to have the skip option and don't want to wait if I need help and the map. So fun. Rated 5 out of 5 by Emerald75 from One of the best games - ever I've played a lot of Big Fish games - and this one is probably one of the very best. Pure fantasy - the story line was simple and easy to follow which made it more enjoyable - all the objects made sense - honestly, just a beautiful all-around great game that I was sad to end. Please please please make more like this! Rated 4 out of 5 by Yurnmesis from Well done move forward game! Overall: Brightness adjustment which was a great bonus! Well-crafted game with attractive scenes and a good story line that moves forward. It starts out with cartoon characters but once done with the intro mostly human characters except for a cute raccoon helper who is not noisy or intrusive. Enjoyed the story line and scenes, well done! Only flaw was the drawn picture ending that was sort of disappointing, but I would play this game again. Graphics: Well done Sounds: Good Music: Celtic. Okay Characters: Most very well crafted Hints: Transports Map: Didn’t Use HOG: Beautifully crafted Mini: Some had more than 2 steps and some were unclear as what to do . Rated 4 out of 5 by campingramps from Great game, great graphics, great puzzles Wish there were 1/2 star ratings because this one is better than a 4 but not quite a 5. Loved the way this one flows and never gets boring with the constant back and forth that is so prevalent these days. All the seek and find objects are straight forward and help the story along. Puzzles are fun with just enough challenge to keep your interest up and the HO's add to the fun. Sadly, the demo ended too soon so this is a buy for me to see where the fascinating story goes. I highly recommend this game and suggest you pay attention to the ratings which is something I rarely advise. Rated 4 out of 5 by pennmom36 from A VERY WISE DRAGON INDEED I'm a fan of the castle journeys, although none of the Midnight Calling games come close to the never ending journey of the original cult classic Midnight Castle. The reason I have been giving the last couple of games in this series only a four star rating, is because of the graphics. Obviously the storylines are enchanting, and I don't expect realistic graphics in a fantasy based game, but these graphics aren't good at all, and way too cartoonish in nature to take seriously, which is a shame, because with better graphics, this series would be a force to reckon with! Diana's father Benedict is a well known magician, who has apparently discovered the secrets of the Wise Dragon, but may not be alive to talk about it! After the entire town was obliterated by a dragon, Diana learns that her father suspected foul play, and left behind clues so that she could continue the journey her father began. Only the worthy, who pass the Wise Dragon's test, are able to see the elusive and of course wise dragon. Could the Wise Dragon be responsible for the town's demise, or are more sinister forces at play here? The Collector's Edition version has some good "frill" extra's, such as Morphing Objects, Achievements, Fresco Fragments and Collectible Dragons. I was a little disappointed however, that the cursor changes to a hand whenever you come across one of the CE bling offerings, and even more disappointed by the raccoon helper! 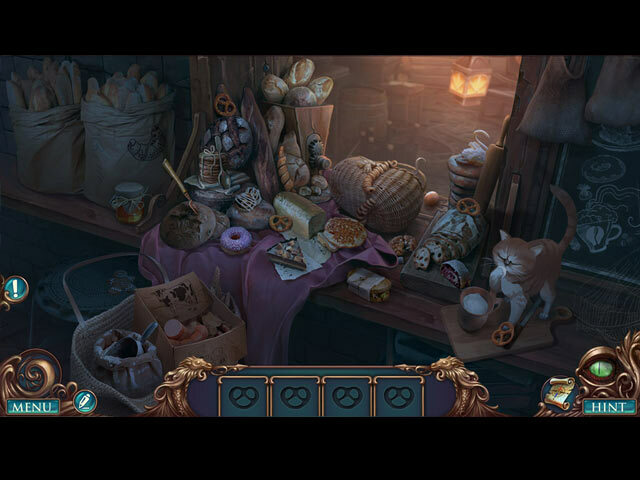 The Hidden Object Scenes are varied with Interactive List finds, Silhouetted Shape finds and Multiple finds. One HOP in particular, I actually found to be entertaining, and rarely offered, which required you to find the exact areas shown inside square tiles. It would be nice to see more of this type. The Mini Games are fairly easy, and some are multi-layered. Below are brief descriptions of some of the games you'll encounter during the demo: 1) Rotate disks to complete the image. 2) Select tokens from the top and bottom that create the symbol shown in the center. 3) Swap disks and select the bottom symbol to change which disks are available. 4) Select and drag circles to rotate and select again to lock into place. 5) Select the outer symbols that make up the symbols in the center. 6) Drag 3 or more identical tiles in several Match 3 games. 7) Move animal tokens along the lines to their matching spaces. 8) Destroy all but one chip by selecting a chip located between two matching chips. 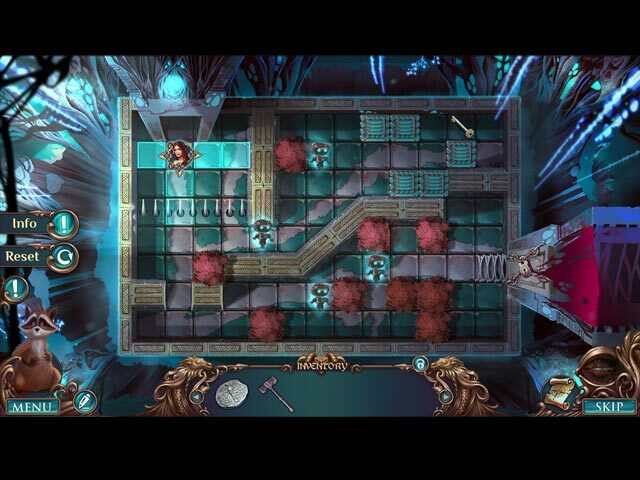 MIDNIGHT CALLING GAMES AVAILABLE Title***Collector's Edition Release Date***Average Rating 1--Anabel (February 17-15) 3.9 2--Jeronimo (June 11-16) 4.1 3-Valeria (January 19-17) 3.6 4-Wise Dragon (August 17-17) 4.5 The Collector's Edition has 8 Wallpapers, 8 Concept Art pictures, 4 Music Soundtracks, 24 Achievements to earn, a Secret Room, Collectible Dragons, Fresco Puzzle Fragments, Morphing Objects, a built in Strategy Guide and a Bonus Chapter, enjoy the castle journey! Rated 4 out of 5 by Novella2 from Beware the dragon This is based on the demo. From looking at the SG, it appears to be a short game, although the demo is 90 minutes. There are 3 modes of play. The drawings are animated. Looks like a fun game.